How does Brexit affect the Nordic countries? 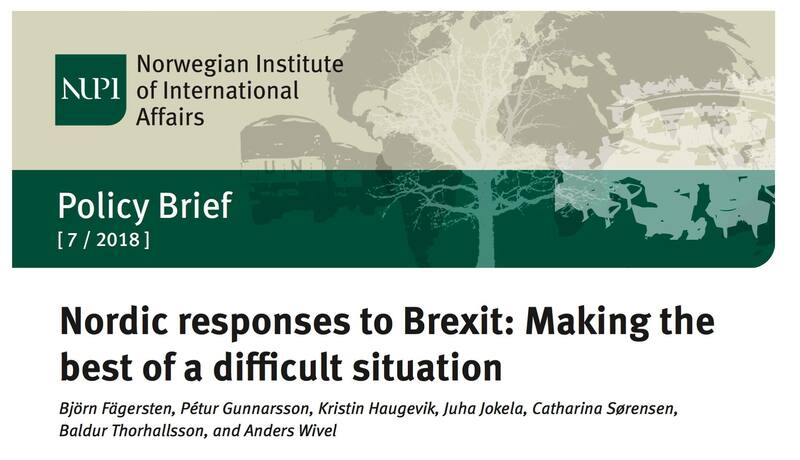 A recent Policy Paper, written in collaboration with Pétur Gunnarsson, Kristin Haugevik, Anders Wivel, Juha Jokela, Catharina Sørensen and Björn Fägersten, features an analysis on how Brexit affects the Nordic countries and how they are preparing for it. Three general findings can be highlighted: "First, … [i]n all the Nordic countries, Brexit has also stirred debates about their current relationships with the EU, prompting EU critics to demand new privileges or opt-outs. Overall, however, the Nordic governments, supported by a stable majority among their populations, have signalled that they wish to preserve their EU membership or current forms of association models, with the access and benefits these provide. Second, for all the Nordic countries, securing good relations with Britain post-Brexit is a key priority, but they have generally indicated that maintaining good relations with the EU must come first. Finally, the Nordic governments are well aware that Brexit could create a vacuum in EU policy-making, perhaps tipping the balance among internal clusters. Britain has been a highly visible member of the ‘Northern’ grouping in the EU, and its absence is likely to be noticed. As the Nordic countries are about to lose what has at times been a powerful ally in EU decision-making, they may have to forge new coalitions to safeguard their interests." The Policy Paper is accessible, in full, here.